Could Dunskey Castle Be A Location In New Lord Of The Rings TV Series? The weekends papers and online entertainment pages have been full of the news that location scouts from Amazon TV posed as tourists so they could check out locations across Scotland for the new one billion pound prequel TV series to the highly succesful Lord of the Rings movie franchise. Locations visited from across Scotland included Portree (Isle of Skye), Loch Lomond, Callander, Scourie and most importantly to us Dunskey Castle near Portpatrick in Dumfries and Galloway. 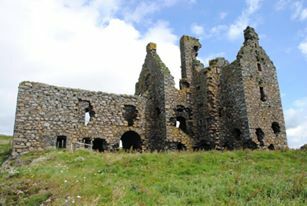 Dunskey Castle is a ruined, 12th century tower house, located 0.5 miles (0.80 km) south of the village of Portpatrick in Wigtownshire.